I'm a bit ashamed because it took me a year to read it after I got a copy from Netgalley even though it is such a short story. Kicsi grows up in a small Jewish village in central Europe, and the story starts as something between a fable and mythology, interweaving Jewish folklore and magic in the story. Although I didn't like that part as much as I thought I would, it was the second half that really confused me. Vörös warns them for the danger and it is clear that the story takes place around the second world war. But all of a sudden, there are a few chapters with the characters in a concentration camp to end with more magic. It felt very weird, not in the least because I can not believe that no matter how small their village was they would not have noticed anything from the Nazi regime at all before they were taken away to the camps. Also, the part of Kicsi in the camp felt somehow out of place or maybe rushed. It left me with an uncomfortable feeling. The main feeling I had when reading, and certainly after I finished was that I didn't really understand the story. I feel like I missed something very important and now all I feel is confused. I'm not sure what the message is the book was trying to convey. 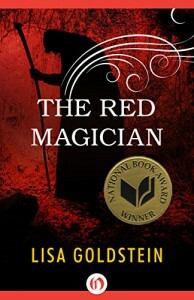 I still have another book by Lisa Goldstein which I will certainly give a chance, because the best part of The Red Magician was certainly the writing. That was really beautiful.